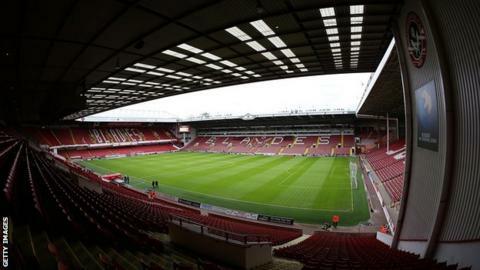 Sheffield United are being investigated by the Football Association over allegations of racist chanting by a group of their supporters. The claims come after Monday's 3-1 win against Bradford City at Bramall Lane. The FA will examine video evidence and speak to both clubs before deciding if any punishment is necessary. Sheffield United, who sit eighth in League One, have also launched their own investigation into allegations of "inappropriate behaviour". "The Blades will take every step to track down and deal with those responsible for any inappropriate actions," a club statement said. "Sheffield United is an inclusive family and community orientated club where everyone is made to feel welcome and it endeavours to improve on this principle year on year. "The club has received complaints about both sets of fans from the fixture - including a number of contradictory reports." Anyone deemed to have taken part in the alleged chanting towards the away fans could face criminal proceedings. Sheffield United striker Bill Sharp also claimed he had coins thrown at him during the game, saying 'Cheers Bradford for the coins' on Twitter after the match. Who reminded Garth of Roberto Carlos? Read more on Who reminded Garth of Roberto Carlos?